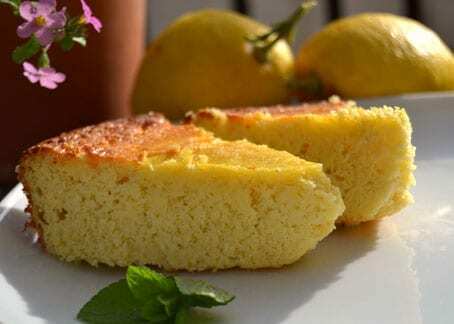 Firstly I must apologise; this recipe for almond, ricotta and lemon cake is not ‘strictly Abruzzo’, it contains plenty of local ingredients that you’ll find used here & you’ll find variations of this served in local pasticerrie all the time, but this is a cake for gluttons like me who’d rather have a couple of slices than just one. It’s gluten free, the divine tasting ground almonds more than filling the traditional boots normally filled by flour and it’s senza the butter; we’re using ricotta after all and in central Italy so no need to add extra fat! A big thanks to Trader Joe for their original recipe. I have simply upped the lemon tang being a complete lemon-head & whisked the egg whites up separately for added lightness. Baked last thing at night it’s perfect to wake up to if the smell doesn’t make you delirious when you’re trying to sleep. For me it’s one of my favourite breakfasts sitting on my little terrace in Abruzzo surrounded by my flower pots with an espresso before I hit my pc, but would be equally perfect for dessert perhaps with a berry compote or, more quintessentially English perhaps, with a large cup of tea. In a food processor grind your almonds if you haven’t been able to get ground almonds with the baking powder, salt and sugar and add to a bowl. Mix the egg yolks, ricotta, lemon zest and lemon juice & vanilla seeds together and add to the dry mixture mixing well. Whisk your egg whites till they form soft peaks and then fold this into your ricotta & almond mix. Leave overnight in its cake tin so that it retains its shape! If you don’t have a springform cake tin you may lose the first piece as it is light and very moist but hey isn’t it always good to try what you’re serving! A wonderful cake that entered my Top 10 list! I have used just a little bit more sugar (120 g.) and added fresh raspberries – this is a real upgrade. Also I suggest using a little bit more baking powder. Thank you for sharing! Can't wait to try this. I had leftover almond floor and now it has a purpose.